Can Oil Prices Find a Happy Medium? What if I told you that there was a period in history where oil demand declined by 5 million barrels per day and non-OPEC supply increased by 5 million barrels per day, yet oil price rallied more than 50 percent? Would you believe me? If your answer is yes, then you guessed right. This was the period from 1979 to 1985. It was a period during which global oil demand declined from over 61 million barrels to 56 million barrels and non-OPEC supply increased from 32 million barrels to 37 million barrels. Yet prices rallied from $17 a barrel in 1979 to $26 a barrel in 1985, while reaching as high as $35 in 1981. The maintenance of this artificially high price band by OPEC (at the expense of its production) led the oil majors to increase their capex from $24 billion in 1979 to as high as $44 billion by 1982. This naturally resulted in a drilling explosion with annual O&G wells drilled increasing from 66,000 in 1979 to a peak of 107,000 in 1984. 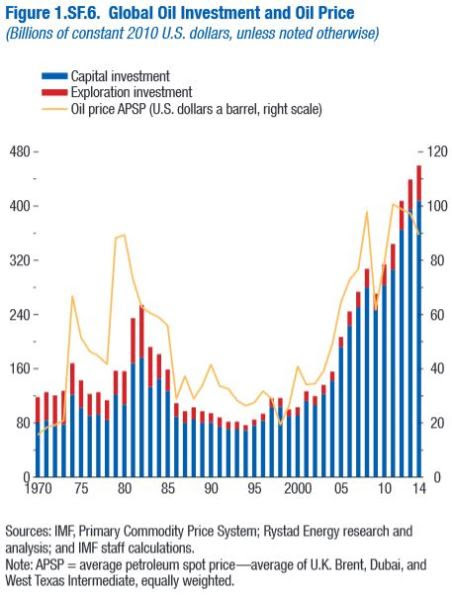 This investment and drilling frenzy lead to more than a doubling in the Finding and Development (F&D) costs from $5 per barrel in 1979 to around $12 by the mid-1980s. 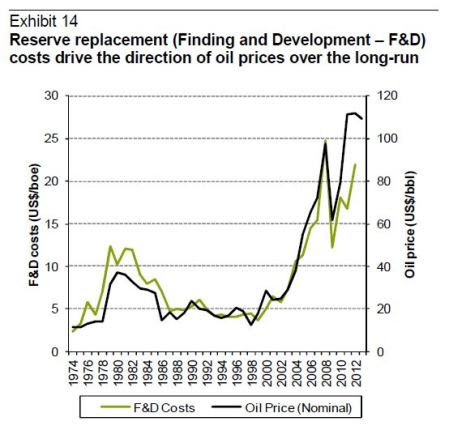 The increase in the F&D cost during that time was not the result of resource scarcity, or extraction complexity, it was the product of a substantial inflation in service costs due to an unexpected surge in activity caused by manipulated prices. Once OPEC ceased manipulating the market, prices quickly reverted to their pre-manipulation economic equilibrium level in the mid-teens, while F&D costs settled back into the $5 a barrel range. 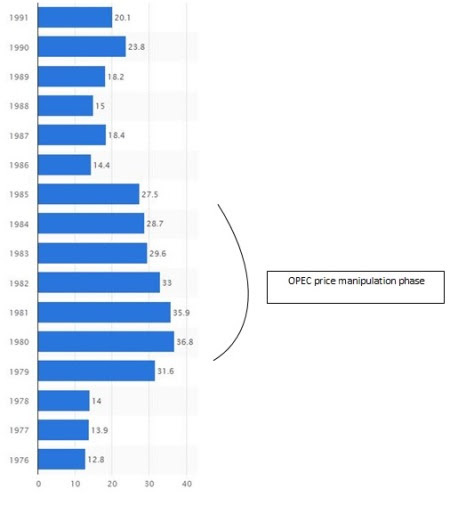 This unfortunate price manipulation episode by OPEC led to the creation of substantial overcapacity in the petroleum industry as it brought forward and accelerated the development of unneeded oil resources, it greatly reduced demand, and it created significant excess capacity within OPEC itself. It took the world until 1991 to achieve the same level of oil demand reached in 1979. 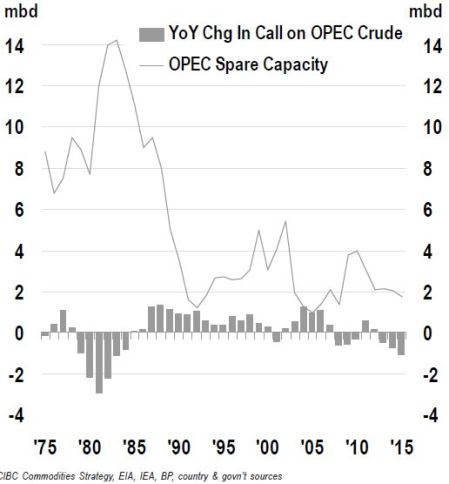 Then from 1991, it took the world a decade and a half of demand growth and the emergence of China in the early 2000s, to exhaust all that non-OPEC excess capacity and OPEC spare capacity that was created during the 1979 to 1985 timeframe. In 2005, oil prices averaged $54 per barrel, a near doubling from the $28 per barrel at the start of the decade. This year is often mentioned as the official start of the 2000s raging oil bull market that lasted for almost ten years, except for a brief interruption following the financial crisis. Between the years 2000 and 2005 OPEC increased its crude and NGL production by 4 million barrels per day, inching up total production from 30.7 million to 34.8 million barrels. However, this was insufficient to meet the over 7 million barrels per day growth in global demand growth during this period, with OPEC excess capacity virtually eliminated, the additional increase in supply had to come from non-OPEC sources. However, after rising from 46 million bpd to 49 million bpd (all liquids) from 2000 to 2004, non-OPEC supply stalled at around 49 million bpd for 3 years from 2004 to 2006, before finally crossing into the 50 million bpd mark in 2007. The pressure on non-OPEC to increase production could only translate into a sizable increase in prices, which in turn encouraged the industry to significantly increase its capex spending. Yet, as prices exploded higher and capex spending hit record after record, something curious happened. Non-OPEC all liquids supply (ex-U.S.) ground almost to a halt, after crossing 43.4 million bpd barrels in 2007, non-OPEC (ex-U.S.) all liquids supply increased by a measly 1.5 million bpd over a 7 years period, a period during which demand increased by over 6.6 million bpd. This brief oil market history illustrates the substantial difference between what transpired in 1979-1985 and what happened between 2005 and 2014. While the 1980s oil bull market was an unquestionably manipulated market that was bound to collapse at some point, the 2000s oil bull market was mostly driven by market fundamentals. The resolution to the last oil bull market was delivered by market forces as high prices unleashed new sources of supply, namely U.S. shale oil. This was different from the 1986 oil price collapse, which was triggered by OPEC ceasing its doomed effort to artificially inflate oil prices. However, the arrival of the above-mentioned geopolitical oil has interfered with the natural balancing mechanism. As oil prices overshot to the downside (and stayed low) due to the arrival of the geopolitically constrained non-market sensitive oil, the O&G industry has been forced to under invest in future oil supply as cash flows dried up and financing costs skyrocketed. The extent of under investment in shale has even been more severe with capex cuts averaging double the global average. The substantial capex-to-supply lag for most of non-OPEC oil and OPEC’s unwillingness to restrict production or gradually ease back the increase in geopolitical supplies has forced an undue burden on shale/tight oil to balance the market on its own. Yet the shale balancing mechanism is far from perfect, shale while relatively fast moving in comparison to other sources of supply, is still a much less efficient balancing tool in comparison to OPEC. This delayed rebalancing caused a large build up in global inventories. Those excess inventories could act as a shock absorber of sorts once supply undershoots, but it remains unclear whether excess inventories alone or in combination with OPEC will be able to compensate for an eventual dual collapse of both shale and non-OPEC supply in the context of sustained demand growth. This oil boom-bust cycle is not a repeat of the 1980s; however, the arrival of shale oil to the global oil scene has created a new oil pricing reality. Nonetheless, it is highly unlikely that this new oil reality is anywhere close to $30 or $40 a barrel as the futures curve is indicating and many forecasters are forecasting. By 2017 as global demand and supply come into balance, and inventories start to draw, oil prices may snap back substantially above the $60-$70 price range as the market transitions from a flood to a drought at some point next year. However, once the next price spike period settles down as shale production catches up to demand once again, prices will likely settle in the $60 to $70 range long term, and remain there until the next noticeable change in demand/supply fundamentals or until the arrival of unforeseen geopolitical events.